Enjoying: I think I'd read the commentary first. Otherwise, the artistic excellences of this film might go right by you in the excitement from a very taut, closely woven crime thriller. Hooray! V-J Day! The War is over! We're through with the Army. We can be with our wives and children. We can buy cars again and shoes and meat and butter. We can just plain enjoy America. Or can we? That's not what we see in this movie. We don't see happy soldiers, celebrating their return to the good old U.S. and A. Rather we see a group of recently discharged G.I.s drifting aimlessly from bar to bar, playing a pick-up game of cards, or living in a dormitory-like hotel under military management. Women come and go. A benevolent sergeant (Robert Mitchum) has sent for one soldier's wife, the man being incapable apparently of sending for her himself. One ex-G.I. describes what he'd like to do, but all he can imagine is drinking three bottles of whisky in a row or going to Mexico. As against this unstable, socially dislocated world, the film poises, in the detective's office, patriotic emblems: a big picture of President Roosevelt very conspicuously displayed, often in the center of the film frame; a copy of the Declaration of Independence; and out the window, the dome of the Capitol. Throughout, the characters talk about the deeds they did in what we now think of as the “necessary war,” World War II. This film came out during the beginnings of the Cold War with Russia and the heyday of the notorious House Un-American Activities Committee (HUAC). Critics and film historians have devoted poured much ink about the troubles of Edward Dymytrk, the director, and Scott Arnold, the producer, before that committee. HUAC. was conducting a witch-hunt against the communists they claimed were infesting every aspect of American life and specifically against present and former Communists in Hollywood under the pretense that they had been propagandizing in movies, movies like this one. Right-wingers criticized this film. Surely, it is subversive to suggest that any American soldier could be guilty of anti-semitism or murder! 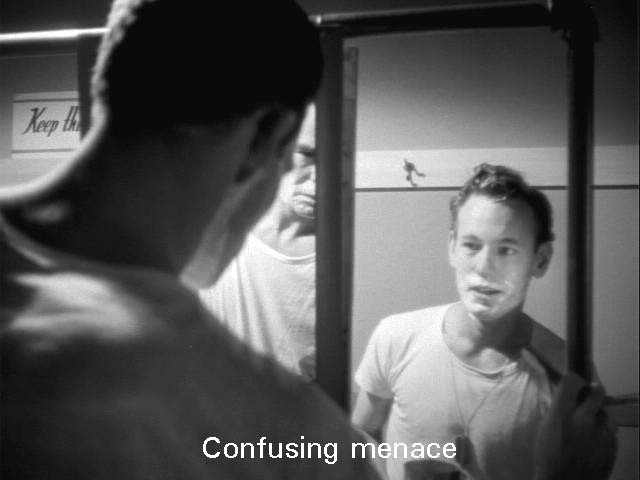 And this film even showed ex-soldiers disoriented, drunk, suffering from some wartime neurosis, instead of heroic ex-soldiers marching happily off to the American Dream. Perhaps that's why Dmytryk included those patriotic emblems. Or perhaps he wanted to pair off American politics against the chaos of the returning soldiers. Critics have paid more attention to the political background of the movie, less to the movie as a work of art. But a fine work of art it is, tightly constructed around a central idea: instability. The commentators on the DVD (Alain Silver and James Ursini) speak of “visual instability,” and that's true. Dymtryk made full use of all the stylistic mannerisms of film noir: black and white film, low-key lighting, scenes at night or in dark interiors, lots of shadows, deep focus, unexpected camera angles, hints (as much as the Code permitted) of illicit sexuality, and, of course, villainous crimes. Again and again, Dymtryk creates a frame in which one character is up, dominating, and one down, dominated. To be sure, this is ordinary Hollywood vocabulary, but this film uses it over and over, culminating in the final shooting. And this up-down, shifting dominances makes one more visual destabilizer. But the instability is more than visual. 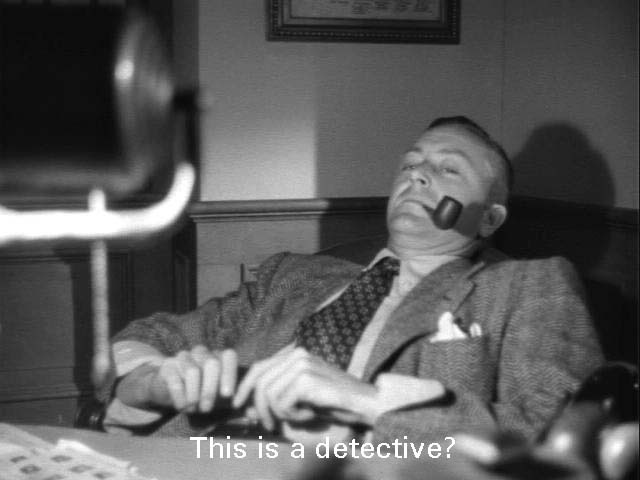 In the midst of all the film noir darkness, Dmytryk gives us Robert Young as the detective. Surprisingly, Young plays him as a bland, benevolent, pipe-smoking Marcus Welby M.D., scarcely the hardboiled Philip Marlowe type usual in noir. He, in a way, continues the patriotic images of FDR, the Declaration of Independence, and the Capitol. He appears immediately after we have seen the shocking scene that begins the movie, a violent, murderous struggle in shadows that we cannot understand. The sudden contrast startles—at least it startled me. 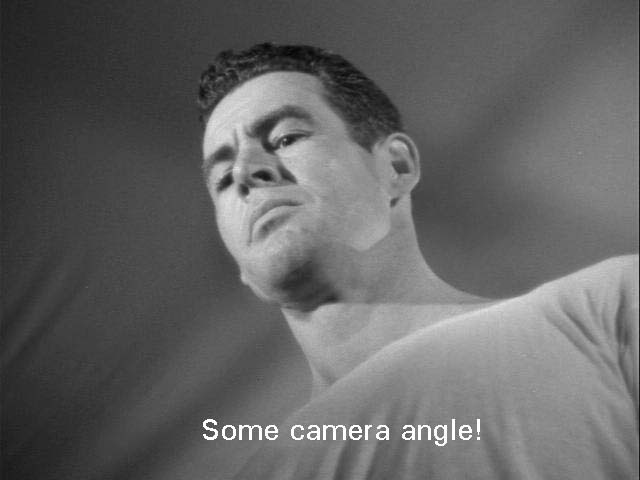 And then I was startled again at the end when this bland detective shoots and kills the villain, no trial and conviction needed in this film noir America (and surely, on this evidence, conviction would have been hard to get). In another de-stabilizing element, the film tells its story through a Rashomon-like series of flashbacks. One of them is false (contrary to the usual Hollywood convention about flashbacks—they are always true). Another flashback, the suspected killer's story, involves his unnamed sickness. He is not drunk but woozy and nauseous. (No cause is given, but perhaps he had what we nowadays call post-traumatic stress disorder.) 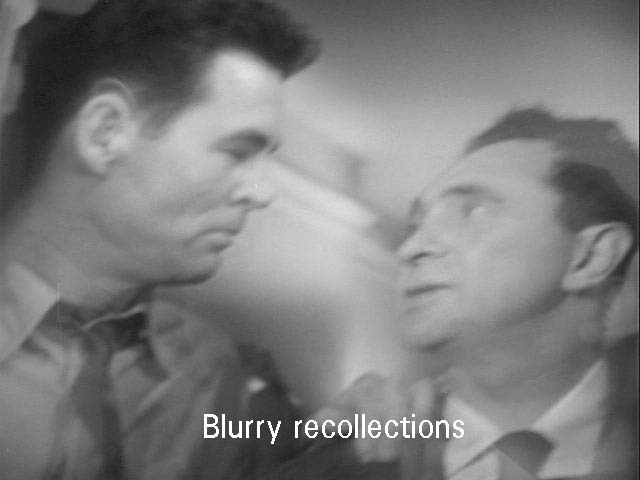 His flashback involves gaps he cannot remember and blurry scenes photographed as if in a haze. The two women characteristic of film noir, the Bad Girl and the Good Wife are both blondes in this film. You could mistake one for the other. It is never clear why the Good Wife's husband chooses to go to the Bad Girl's apartment, either, another confuser. In the second scene of the film, showing detectives working the murder scene, Montgomery (Robert Ryan, Oscar-nominated for this performance) knocks on the door. Seeing the crowd inside, he apologizes. “I'm sorry. I must have the wrong place.” The end of the movie depends on this same character going to the wrong door, trying several doors in the process. Throughout, doors open and close in unexpected and sometimes confusing or obscuring, including a door into the balcony of a darkened movie theater. There, the movie’s romantic music provides the accompaniment to a love scene between a reunited husband and wife (Jacqueline White and George Cooper), another blurring that confuses (at least) me. 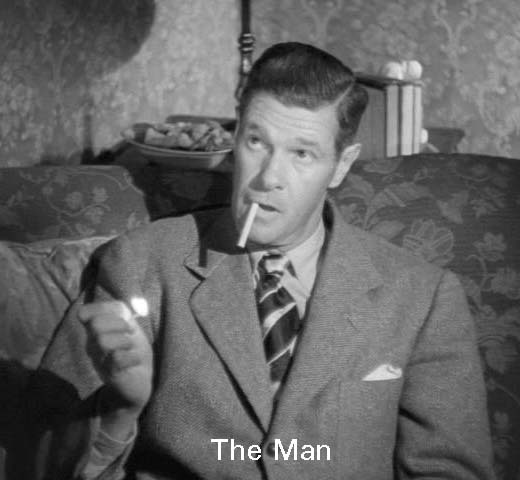 At the center of the movie, a character identified only as The Man (Paul Kelly) appears. He seems to be the husband or perhaps the pimp or perhaps just another customer of the Bad Girl, Ginny (Gloria Grahame). He tells one story after another about who he is and what his relationship is to Ginny, then admits one after another that each is a lie. And at the end we never know the truth. Yet it is he who provides the alibi that exonerates the suspected killer, a crucial, central role yet completely mysterious. Sergeant Keeley (Robert Mitchum) plays another ambiguous role, sometimes seeming to help the detective, sometimes trying to hinder him. At the end of the film, he walks off with the most helpless of the G.I.s into the shadows of an uncertain future. The detective points the moral rather crudely: hate kills like a gun. The central contrast is between the mildness of the victim and the detective as against the hate and fury of the anti-semitic villain. This is one of rare pictures in Hollywood under the studio system to deal explicitly, even preachily, with a social or moral issue. Nevertheless, this picture hardly says much for moral or political courage in profit-driven Hollywood. After the discovery of the Nazis' death camps, Hollywood evidently decided it would not lose any profits if it went after bigotry, specifically anti-semitism. (Twentieth Century-Fox made Gentlemen’s Agreement at the same time as Crossfire.) But going after anti-gay prejudice? No, although the novel on which this movie is based dealt with the murder of a gay man, not a Jew. Dymtryk managed, however to get in a number of hints in the faintly gay behavior of the victim Samuels (Sam Levene). And, as a work of art, this picture merits your careful watching. Enjoying: Watch the doors. Watch how the character of Montgomery subtly emerges.